Greetings all! We hope you’ve enjoyed your summer. 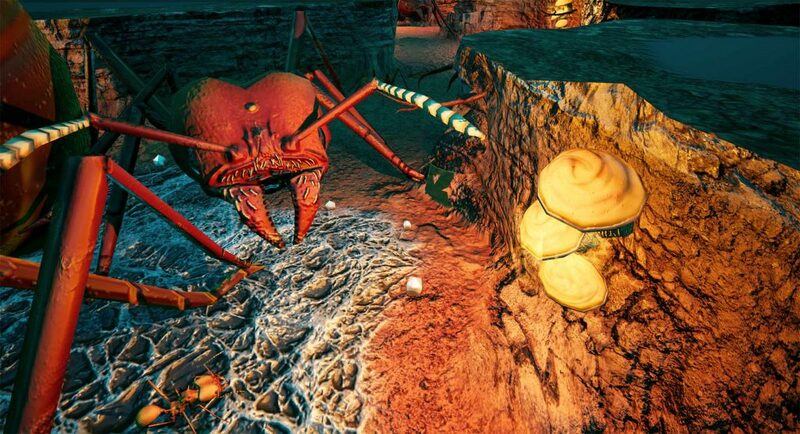 Time moves on relentlessly, and as we chug the first pumpkin spice latte of autumn we’ve made significant strides in the progress of the leafcutter levels as well as plenty of other exciting things. We’ve recorded with our voice artists Mary Jo, Eric and Callum (Scientist 1, Scientist 2 and Narrator respectively) for the next levels and we’re delighted with their work. Before we conclude our work on 3.1, 3.2 and Formicarium Challenge 3, there are some missing bits and pieces in the existing game that need finalising in preparation. Our current plan is to do an interim update between now and the leafcutter update, and that’s going to be fairly soon. Let’s get on to what that’ll include! The interim update will include the challenge mode for levels 2.1 Rising Tide and 2.2 Queen of the Hill. It was always our intent for each tier to have its own special mode with an extra challenge – and we’re now at the point that we want to get this all up to date before any new levels arrive. 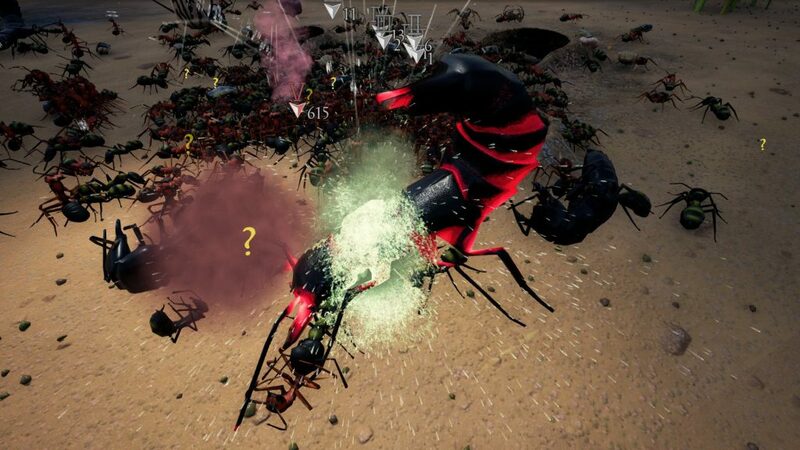 Activating challenge mode on the 2nd tier levels will introduce lightning-fast beach tiger beetle larvae to the fray. Even in their larval forms, the beach tiger beetles are extremely deadly. They live in small burrows, lying in wait for a hapless victim to pass by – which they then grab with frightening speed. 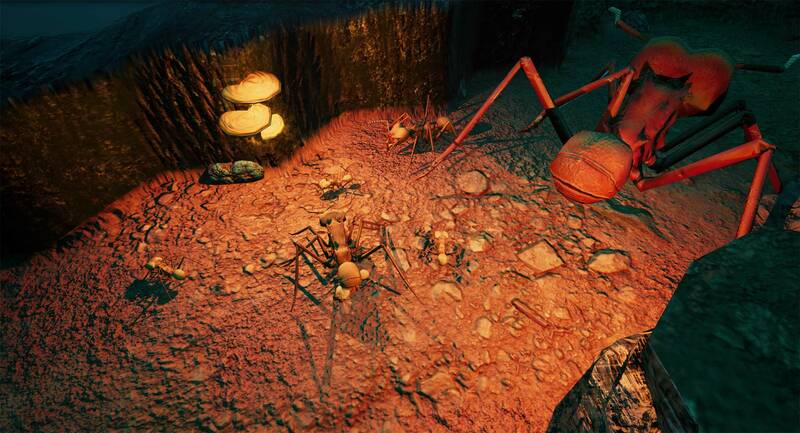 Matt has done some beautiful work bringing these living nightmares to our game – have a look at the screenshot below. We have introduced a new way of spending royal jelly to improve certain aspects of your formicarium colony. 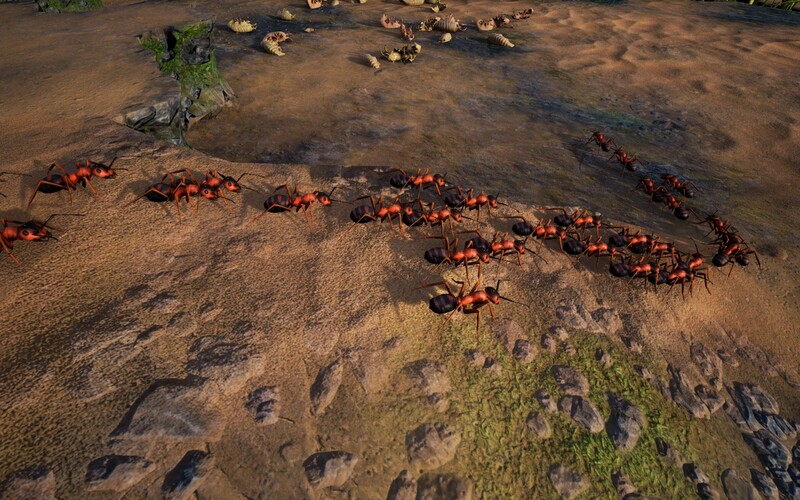 The type of tweaks that can be made depend on the creatures themselves, but there are 2 types for workers and queens and 4 for the black ant soldiers and wood ant ranged units (there will also be 4 for the leafcutter majors when they arrive). Spending jelly will give a stat improvement. This can be done multiple times but will cost much more each time you do it. It’ll also be a way for those of you who are sitting on a cache of royal jelly to spend some of it before the next update (but don’t feel like you have to grind for it – you don’t!). The exact ins-and-outs of this new system will be detailed when the patch comes. The recent recording sessions with our lovely voice actors have given us the opportunity to add some dialogue we felt was missing from certain points of the current game – particularly in freeplay. 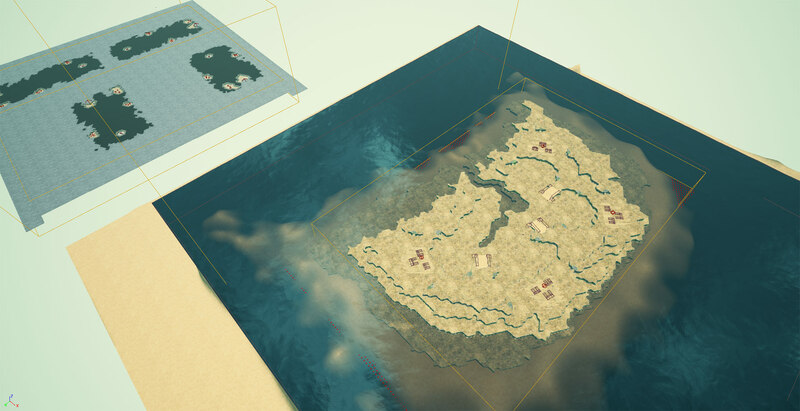 There will be some extra narration for this game mode, as well as some small bits and pieces for the campaign levels. Whilst you’ve been getting heartily stuck into Freeplay and the response has been great, we realise that there’s not much in the way of variety at the moment. To that end, the interim update will include a brand new Freeplay map! Towhead is set on a small sandbank in a body of water, which has some interesting implications for resource gathering. It hasn’t been decorated yet but you can see how things are shaping up from the in-editor screenshot below. The work-in-progress Towhead. Note the unusually-shaped underground spaces! Whilst previous levels were set on a beach in a temperate environment, the next set of levels take place in the humid subtropical rainforests of Ecuador with its clay-rich soil. This gives a distinct red hue to the underground. We also have luminous fungal growths illuminating our Leafcutter colony instead of the crystals from the beach levels – a little extra flavour given that the leafcutters themselves are fungus farmers! Here’s the current animations for the leafcutter major. Pay particular attention to that leaf-cutting action – after all, that’s what leafcutters are born to do. Liam put together this little montage of test material showing the various ways that the leafcutters are being worked on. 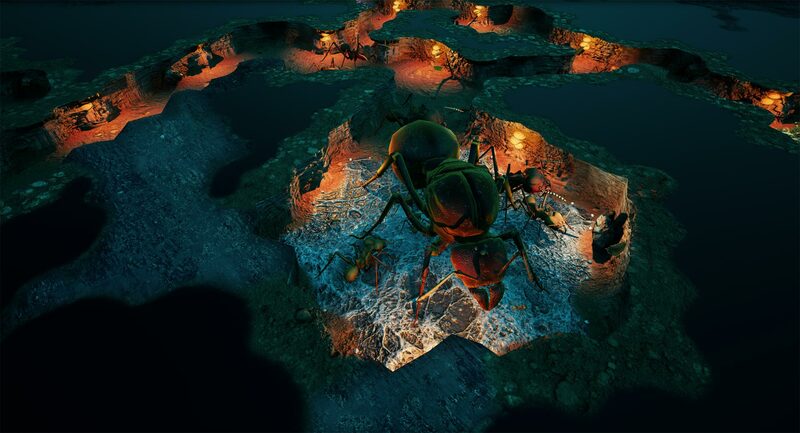 You can see an example of the upcoming size hierarchy system that will allow some ants to literally run under the legs of bigger ones, as well as seeing some of the vertical ant movement that Matt has been working on to allow leafcutters to collect cuttings from leaves above floor level. There’s also a small audio snippet of what Scientist #2 is up to in the next update. Frankly, he scares us. Anyone who has watched the live streams will have seen how putting levels together is a time consuming process (even ones that do not have a story), so to help with this we have developed plugins for Unreal Engine. These allow us to change tiles with a variable size spherical tool in many ways (raise, lower, dig out, make indestructible and even paint) not only speeding up level design but making it more intuitive. Please note that although this time-saving measure is a good thing for the project, we are not currently planning to release a level editor for the game. For now these are UE4 plugins that benefit us – if everything is going well when the game graduates from early access, we might revisit the level editor idea. But not yet! There has been little in the way of live streaming recently – and for good reason. 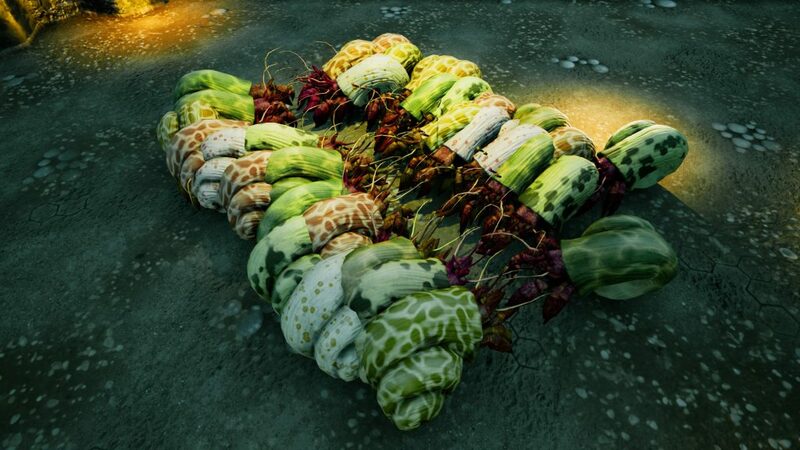 John likes to keep his streams relatively spoiler-free, and pretty much all of his current work has been leafcutter-related. We don’t want to spoil all that good stuff for you prematurely. It’s rare that we see an EotU-playing YouTuber who’s also an antkeeper IRL, so of course we’re going to watch their videos when we do. 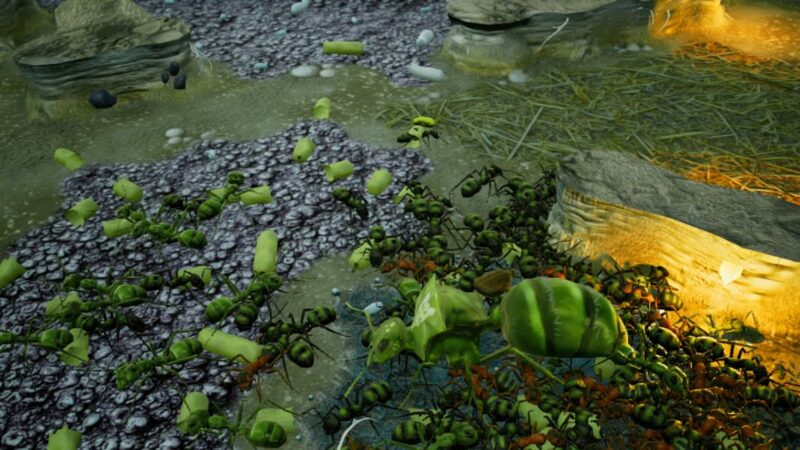 ManOftheAntz plays the game from a remarkably unbiased perspective, given the subject matter, and manages to be damned entertaining whilst he does it. We’ve thoroughly enjoyed watching his trials and tribulations with EotU, and we look forward to seeing how he does with the upcoming content! As has fast become a tradition for the newsletter, we like to trawl through Steam screenshot uploads and manually-emailed submissions (send them to mike@slugdisco.com) for fun screenshots. F12 does it by default on Steam, if you’d like to participate.